For parents and Sunday School teachers of children taking their early steps into reading. First books need first bookmarks, and with these bright book marks children will be reminded of the life-filled stories of the Bible and treasure them as a memento of their first times reading about God. A beautiful pack of ten bookmarks, consisting of 5 copies of 2 different fresh and contemporary designs. 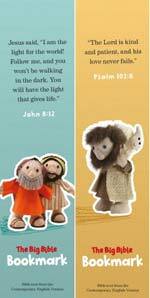 With characters drawn from the Bible Friends series, these bookmarks make great prizes or giveaways for under 5's.